Overpriced. I could not quite imagine 2 scoops of such ice cream cost more than $10. This is the price for dining in which inclusive of GST and service charge. There is a difference in pricing for taking away and dining in. To avoid unnecessary costs incurred, it might be better to have it take away. 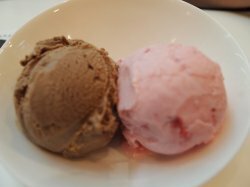 I ordered strawberry and cream together with a hazel flavor ice cream. The hazel flavor tasted nicer as compared to the strawberry one as the strawberry flavor tasted quite ordinary.